Art history is a fundamentally visual discipline. Art historians spend a lot of time designing courses on “visual culture” and writing lesson plans to teach “visual literacy” and “visual analysis.” Teaching students “how to look” is often one of the main learning outcomes in the syllabi of introductory art history courses. With all of this emphasis on vision and seeing, art history seems like one of the least accessible disciplines for a student who is blind or visually impaired. However, there are ways to create more accessible art history courses, as I discovered last year when I taught a student who is blind in my prehistoric to medieval art history survey. 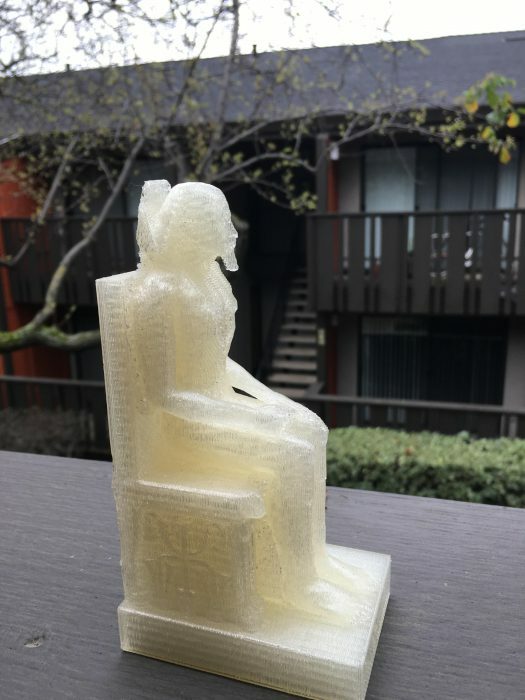 While I am still learning how to design an effective art history course for a student with a visual impairment, I wanted to share what I have discovered so far, focusing on one particularly effective tool: 3D printing. Throughout this experience, I was constantly reminded of the importance of keeping a dialogue open with the student. This course was a collaborative effort between the student and myself and without his feedback and ideas, it could not have been a success. For example, I initially discovered a series of online textbooks titled Art History through Touch and Sound. Each unit contains verbal descriptions of canonical works of art, interpretive sound compositions inspired by the artworks, and most significantly, tactile diagrams that allow students to use their sense of touch to experience art. However, the student told me that he had never been able to get much information from tactile diagrams, so we decided not to use this resource. Instead, we relied upon a sighted assistant provided by our university’s Office of Services to Students with Disabilities to describe works of art to him, audio descriptions of relevant works of art such as the British Museum’s History of the World in 100 Objects series and a set of 3D models that I had made. Since buying replicas of artworks would have been prohibitively expensive, I began investigating the possibility of using a 3D printer to create models of sculpture and architecture. 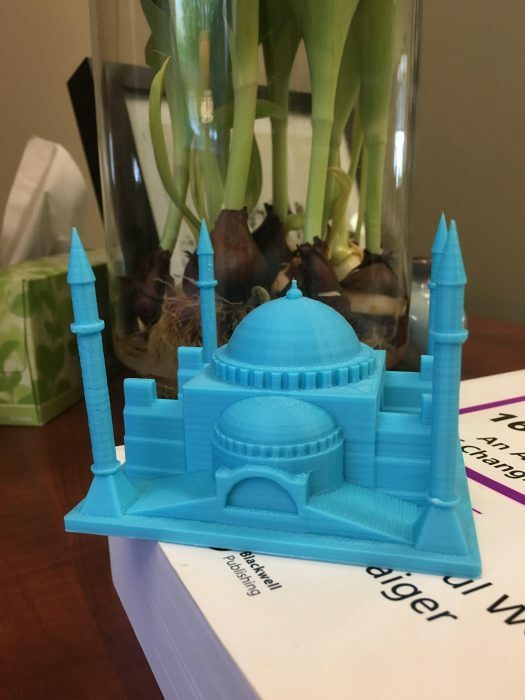 Fortunately, I was able to work collaboratively with the Math Department at my university to have the models printed for me using their printer. Alternatively, I have since learned that some public libraries have 3D printing capabilities and may offer these services for free. If neither of these are options, maker’s spaces are becoming increasingly common in many cities and may provide an economic way to print 3D models. I collected the plans to print the 3D models from various websites, including Sketchfab and Thingiverse (see the list below). The British Museum in particular has put much effort into creating a large repository of plans to print out. I also found models created by Cosmo Wenman to be useful and of very high quality. While scans of ancient works of art are becoming more abundant, there is still a severe lack of files available for medieval works of art, as can be seen in the file list below. Fortunately, I did come across Elizabeth Lastra’s digital humanities project, RomanesqueSpain, and she was able to provide me with 3D models of a Spanish Romanesque sarcophagus and baptismal font. In place of taking exams, the student used these models to write analytic and interpretive papers. For example, he evaluated various theories proposed by scholars explaining the meaning and function of the Woman of Willendorf by analyzing the form of the statue, as experienced through the sense of touch. He wrote another paper comparing and contrasting the Getty Koros, the Doryphoros and the Dying Gaul to examine Greek depictions of themselves and others. His final paper was an analysis of whether or not the label “Dark Ages” is appropriate to describe the medieval period, using architecture and sculpture as his evidence to argue against the use of this term. 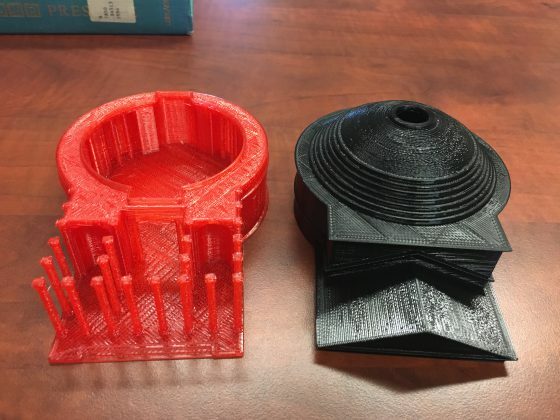 I asked the student to provide some feedback on the models for this article and he said that the prints of architecture and non-figural sculptures were easier to understand than human forms and that the simpler the work of art, the better. Art works with a lot of intricate detail, like the Romanesque baptismal font, were more difficult to understand. There are many more resources that art history instructors could use to help make art history accessible to a student who is blind or visually impaired, depending on location and the subject of the course. For example, some local museums or universities might still have plaster cast collections, and it may be worth asking if a student could touch the pieces using gloves. Increasingly, museums like the Smithsonian American Art Museum are offering tours and programming for visitors who are blind or visually impaired. If teaching a course on contemporary art, a visit to a local artist’s studio may be helpful. Ultimately, any strategies and assignments should be developed in collaboration with students in order to provide effective learning experiences. Creating a version of the art history survey that is accessible to students with a visual impairment requires creativity and resourcefulness. 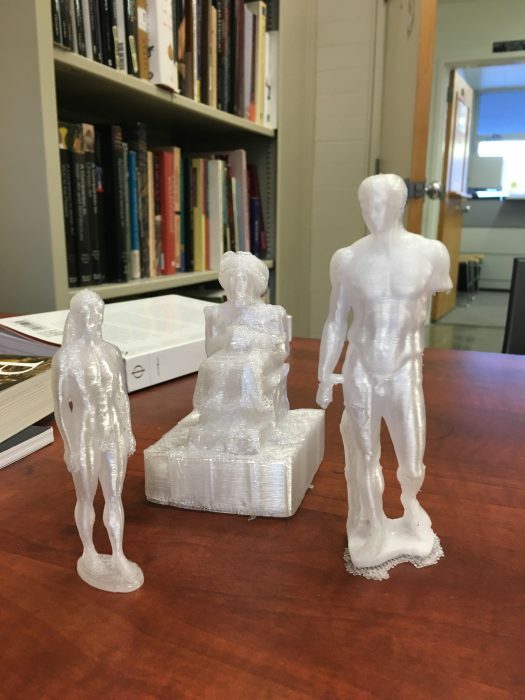 Luckily, technology like 3D printing is expanding the possibilities of how we can create a more inclusive learning environment and expose more students to the study of art history. Axel, Elisabeth S, and Nina S. Levent. Art Beyond Sight: A Resource Guide to Art, Creativity, and Visual Impairment. New York: Art Education for the Blind, 2003. When collecting models, it is important to understand what file types are compatible with the printer and software that you’re using. There is an online file converter, but we had limited success with it because the cap on upload sizes is 15MB. (www.meshconverter.com). I am wondering if there are 3D printers on my campus if ALL students could be required to print out one of these and write a paper on it, because they could touch and move it all around. Do these links give specs so that you could print your own? A campus technologist/3D-printing specialist can help you with specifications if none are included in the links to ensure a successful print. 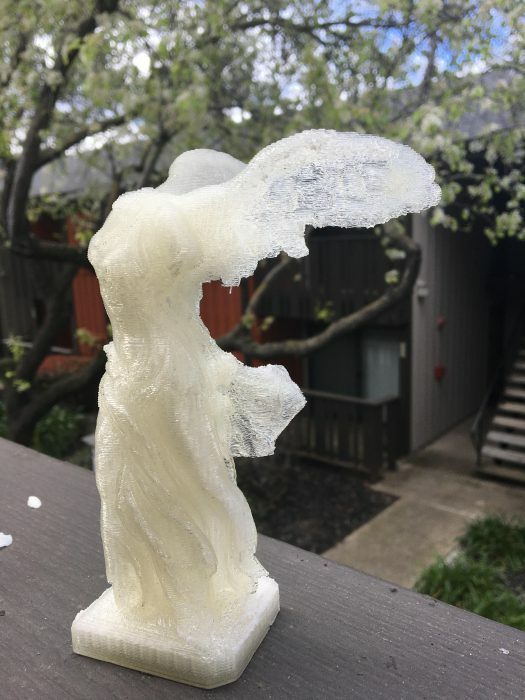 I work extensively with 3D printing for classes- both my own art history ones and helping other faculty- and the main issue is scaling up to large classes. This is because some print services on campus cost money (requiring students to cover it themselves if it’s not free or covered by materials costs) and the amount of time it takes to print. Even small prints can take 4+ hours depending on the specs. I’m working with a class of 30 students now and it’s going to take the whole semester to get each student in to print the specified model the professor selected. That’s not a deterrent and I’ve had a lot of success, but it requires a fair amount of advance planning, especially if you need to book the 3D printers in advance. I’d be more than happy to chat with anyone about my experiences or direct you to some of my presentations/publications on the topic: jgrayburn@temple.edu.